The Taccia bottled fountain pen ink, developed in Japan and inspired by the Japanese way of seeing color. All of the colors inspire the way you felt as a child first seeing a set of crayons. Taccia colors are true to what they believe colors should look. Each bottle of Taccia ink has the perfect balance of permeability and viscosity, making an ink that flow nicely on paper without hurting fountain pens. The ink is carefully formulated pH neutral so it will not damage resin or celluloid. Each bottle comes in a 40ml glass bottle. The fountain pen ink is water soluble dye and aqueous ink. 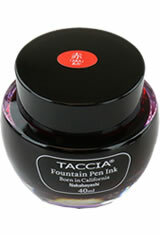 The Taccia Bottle(40ml) Fountain Pen Ink usually ships within 1 business day unless otherwise specified. Each Taccia Bottle(40ml) Fountain Pen Ink we sell is guaranteed to be genuine, authentic and will arrive brand new & unused! I love these inks. I think they are a fantastic value and truly an unsung hero brand among fountain pen inks. I have the Olive and Golden Wheat. I really do love them and think especially the Golden Wheat is one of the best colors out there for hand lettering in sepia type color schemes. Its rich, warm, and truly a lovely hue. The Olive is warmer than normal olive and stands out as well among greens. It's dark enough to not look like faded hand writing, but really shows its color well. I use the olive to sketch with a glass pen a great deal. Very muted maroon/purple. Very readable. These are good colors and behave well so far. Nice shading. Great price. Are the inks waterproof when dry?